YouTuber MKBHD recently unboxed the iPhone 7 and iPhone 7 Plus on his channel, showing the contents of each smartphone's packaging, the boot-up of iOS, and even a quick overview of official Geekbench benchmark results. In the video, the unboxed iPhones encompass the new Jet Black and Black color options, for the iPhone 7 and iPhone 7 Plus, respectively. Interestingly, once MKBHD begins cycling through the iOS set-up process, he discovered a new step on iPhone 7 that focuses on the haptic feedback of the new Home Button. After confirming your language, region, and setting up Touch ID, Apple ID, and Siri, the iPhone 7 will allow you to "meet the new Home Button." 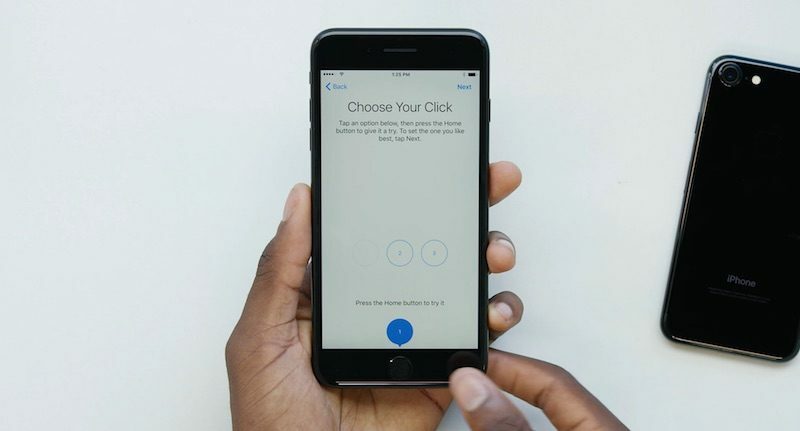 The added process in iOS 10's start-up on the iPhone 7 and iPhone 7 Plus makes "your iPhone experience even more personal by choosing the click that's right for you." Here, the iPhone will present you with three options of varying haptic feedback clicks. MKBHD described option one as "really light," almost to the point where he wasn't sure if he was pressing the button or not, three as "a really firm click response," and two as "a default, somewhere in the middle." He said with the middle option the "whole phone seems to be vibrating still," but he decided to go with the highly responsive third option to be sure when the button's been pressed. Otherwise it seems like the contents of each iPhone 7 box, and the set-up process, are largely what's expected at this point from Apple. Each iPhone comes with the usual paperwork, Lightning cable, AC adapter, and now the new Lightning EarPods and Lightning-to-3.5mm adapter, which are the biggest changes this year. MKBHD's video showcases the colors of Jet Black and Black as well, and he recommends the matte Black finish over Jet Black, which he calls a "special edition" iPhone that's worth checking out in a store, but might be frustrating to keep clean sans case. He also runs a quick Geekbench test, confirming 3GB of RAM in the iPhone 7 Plus and single-core and multi-core results that fall largely in line with previously reported benchmark results. As expected, the iPhone 7 has 2GB of RAM, but MKBHD didn't put it through the paces of a Geekbench run. Excitement for the iPhone 7 is growing ahead of the wide release tomorrow, September 16. Last night, Apple confirmed that all models of the iPhone 7 Plus as well as the Jet Black iPhone 7 have completely sold out ahead of Friday's launch and will not be available at Apple's retail stores for walk-in customers. Those prepared to buy other models are already lining up at some Apple stores, including the 5th Avenue Apple Store in New York and Apple Union Square in San Francisco. There are too many set up screens in the current iOS. It used to be so simple, straightforward and fast to set up. Whatever happened to it "just works"? Today it works, but only after a big quiz. You realize that everyone would complain either way, right? There's people like you and then there's the people who want to be able to customize things. I'll accept the Touch ID setup t save myself from putting in a passcode every time. Maybe the default click isn't my favorite. Who knows, but why complain? Apple needs to make a stand on what features its products offer as default. Simple features should be set up from the get go. If users don't like them, then they change them in settings. Apple's job is to make simple software and hardware. When it starts asking users lots of questions, then it misses the mark entirely. In some cases, new users don't even understand the questions or the context. Whatever happened to it "just works"? Today it works, but only after a big unnecessary quiz. It's so annoying to me how entitled and spoiled some Apple users are. They want more and more features but yet don't want to set any of them up, they want everything to just magically know your preferences and how you want your phone to operate. Seriously, come on. Dude, you got by 10 years ago standards a "super computer"... in your freagin' pocket! Cheer up, smile, be happy. Anyone else slightly disappointed by the EarPods being in a cardboard frame instead of the nice case they came with in the 6-series phones? On an article that I didn't think would warrant any complaints, the two top comments are... complaints. Amazing. Great, yet another setup screen. They need to add a "I'll deal with this crap later, thanks" button. The effort to select and tapping your choice within 3 seconds is just too much to handle.